Based in the Netherlands, Leapfrog 3D Printers was founded in 2012. The company makes both consumer-grade and professional, semi-industrial machines. The industries in which the machines operate are: engineering, automotive, aerospace, healthcare and education. Today the company offers three different professional 3D printers, including the Xeed 3D. With a wide choice of materials, very tight precision and a unique dual-extruder design, Leapfrog’s Xeed 3D printer is a designer’s dream come true. It not only gives you the power to define details, having a solid granite building stage, but it’s also fast. Its sub-$10,000 price makes it a great printer for those with lots of different prototyping and production tasks. Based on fused deposition modeling (FDM) technology, the Xeed 3D lives up to its name with one of the widest choices of raw and support materials. In addition to being able to build with nylon, polyethylene terephthalate, polylactic acid (PLA) and acrylonitrile butadiene styrene (ABS), the company has a hybrid filament with properties between PLA and ABS as well as a flexible plastic for hoses and experimental materials. The company recommends using Verbatim‘s polypropylene filament when your project calls for toughness and heat resistance. The stock filaments come in five colors, but not all materials come in all colors. For instance, while ABS is available in black, white, red and green, you can only get PLA in black, white and silver, falling short of MakerBot’s rainbow of filaments. The hybrid material is only available in clear filament. The good news is that the filament raw material comes packaged on spools. It is economical to use at $40 to $60 per reel, but waste material can’t be recycled. Xeed 3D also gives you the choice of two support materials: high-impact polystyrene (HIPS) and polyvinyl alcohol (PVA) from SpoolWorks. Both can prevent warping and sagging on critical portions of the object but have different roles. You can wash the PVA supports with water; HIPS is dissolved in limonene, an inexpensive solvent extracted from citrus rinds. It offers a frustration-free startup routine. You don’t have to manually feed the filament through guides into the extruder and hope for the best. Rather, Xeed 3D’s automatic threadic mechanism grabs the filament end drawing it into the extruder. Within a minute, it’s ready to print. Capable of printing layers between 10 and 350 microns thick, the printer has an overall resolution of 10 microns. This makes it the 3D printer to use when precision is essential. Such examples are for architectural models, medical prosthetic devices and tiny gears. For instance, a university is using the printer to make a novel drug delivery mouthguard. It combines the active ingredient incorporated into the base polymer, either PLA or PVA. Because it has two extruders in its printhead, the Xeed 3D can double the potential of 3D printing. It gives you the choice of laying down the build alongside supports or printing in two different colors without stopping to change filament reels. By contrast, Leapfrog’s $9,000 Bolt Pro printer has two separate single-extruder printheads that can also work with two different filaments. The printer comes with a heated glass build platform that increases consistency of the item. For using ABS materials, Leapfrog also has an optional granite stage, which costs about $600. The Xeed 3D is fast, with the ability to run at up to 180mm per second, nearly 20 percent faster than MakerBot’s Z18 system. Able to create items as big as 11 x 8.7 x 9.1 inches, it can also make things as large as 14 liters, but only at 11 inches long, much shorter than either the Z18 or the Stratasys Fortus 250mc are capable of. 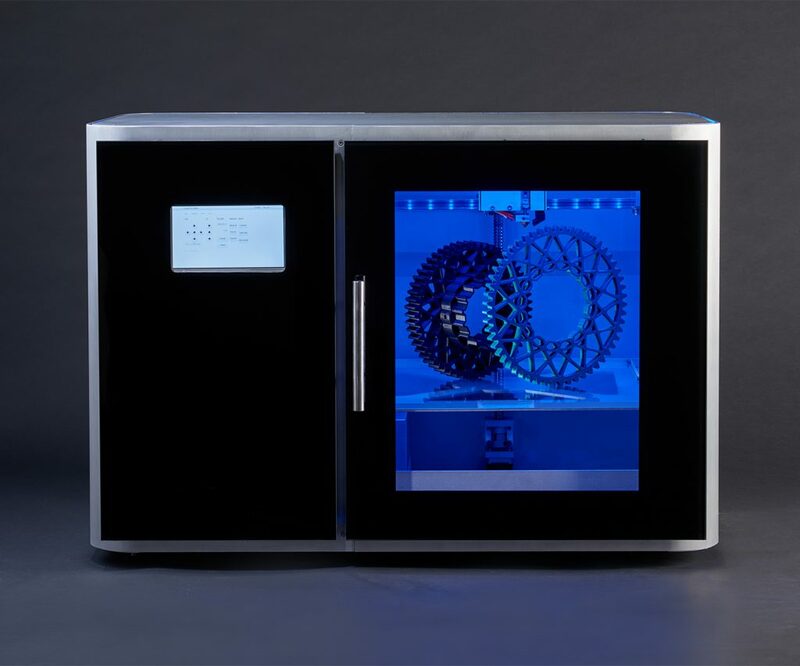 Rather than being tall and narrow, the Xeed 3D printer has a unique horizontal design. The build chamber is on the right with the system’s electronics, and there’s a pullout drawer for the filament spools. At 35.4 x 22.8 x 25.1 inches and 150 pounds, it can sit on a shelf or table, but Leapfrog doesn’t sell a cart or stand for the Xeed 3D. Its 7.1-inch touchscreen is the center of attention. The setup section has an industrial look to it, with prominent up, down, right and left arrows next to rectangular boxes with choices. It can show what’s being printed along with material choices and print quality. The screen displays progress and a preview of what it will look like. Should something go awry, the printer keeps a log of all communications. Rather than a homegrown app, the printer comes with Simplify3D software, which works with other commercial printers. The recently updated Version 4 adds the ability to vary the printing characteristics throughout the model and quickly reprint items while reducing the support material required. It starts with STL, 3MF or OBJ CAD files and can automatically correct for design faults, add supports, and help optimize a tray of small parts. A big help is that Simplify3D shows a realistic preview of the item with different areas – like perimeters, infills and supports – shown in different colors. The software is available for all sorts of PCs, from elderly Windows Vista systems to the newest Windows 10 workstation, as well as Macs with OS X 10.7 or newer software. There are no apps for phones or tablets, but Simplify3D covers Linux very well with compatibility for Ubuntu, Debian and Fedora systems. Designed to be set up and left alone, the Xeed 3D does without a built-in webcam for remote monitoring. It can connect to a company’s LAN with Wi-Fi or wired Ethernet. At any time, you can pop in a USB flash drive containing the needed files and quickly get a print started. The printer doesn’t require much in the way of maintenance. Just keep the stage and area around it clean, but you might need to clear old filament from the extruder, which requires removing it from the gantry. Unfortunately, it doesn’t snap out like the X18’s does, instead of requiring you to loosen two screws. The printer comes with a one-year warranty, but Leapfrog will add a year for $1,400. The company runs live webinars to train people to use the Xeed 3D and other products. The programs include setting the printer up, using the software and touchscreen, and getting the first prints out. There’s a Q&A session at the end. Like most other 3D printer makers, the Netherlands-based Leapfrog doesn’t have technicians on call 24/7. You can phone them or get into a chat window from 8 a.m. to 4:30 p.m. CT, and they respond to email queries. This is a copy of the original review business.com made on the XEED 3D printer. For the original article, click here.